I want to capture an image from my webcam and save & load into my robo file. With this done I wanna display the image number onto my lcd attached with arduino using serial communication. The first part is done but the image number is not being displayed on lcd. The lcd is perfectly working with other program and does load this program as well but image number remain 0 .Can anyone help me with this? Attached is my robo file and print screen of the Arduino sketch that I tried. There are two main issues regarding this solution. The first one is that you are missing any serial.read code from the Arduino sketch. You have to read the image_number from serial in order to expect that the number will change. It doesn't automatically get assigned to your IMAGE_NUMBER variable in your arduino sketch. Its just not that sophisticated. 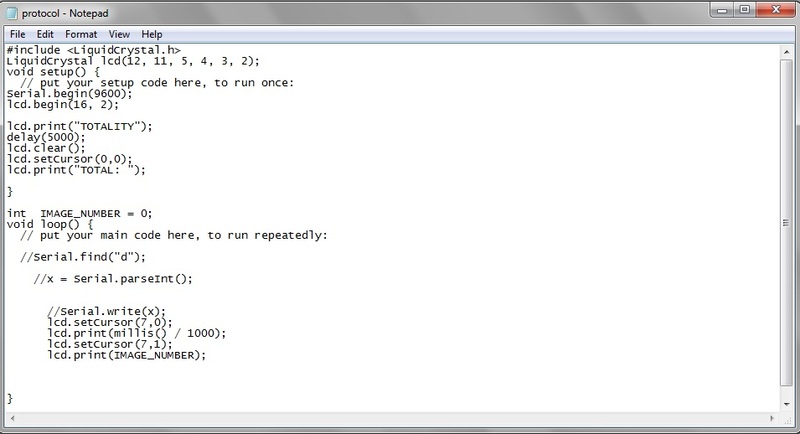 See the Arduino examples on how to read a number from serial. in your RR serial module otherwise the Arduino Serial.parseInt will not know where the end of the number is.